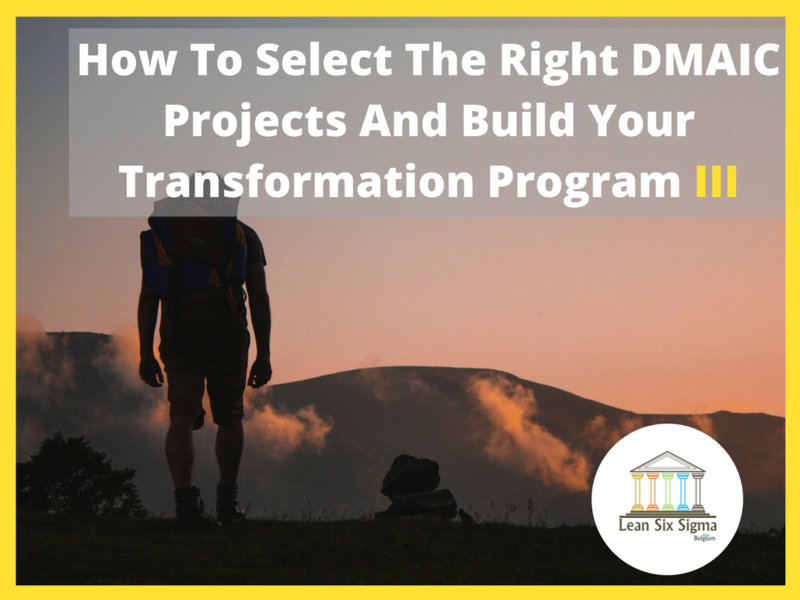 After you have obtained the sponsorship of the executives in your organization, it is time to now move on to selecting projects that will shape your business’ transformation program. DMAIC is a problem-solving technique that is an integral part of Lean Six Sigma. The methodology consists of five phases: Define, Measure, Analyze, Improve, and Control. A DMAIC project is the name given to a Lean Six Sigma project that is aimed at solving a problem within an organization (such as waste reduction). So, how can you select the right DMAIC projects for your organization? This is the first phase of a Lean Six Sigma improvement project in which you define the problem with a “problem statement” and then define the goals that you need to achieve with a “goal statement”. The project leader (Black Belt for exemple) is responsible for creating a Project Charter, developing a process map, and understanding the needs of the customers associated with the process. 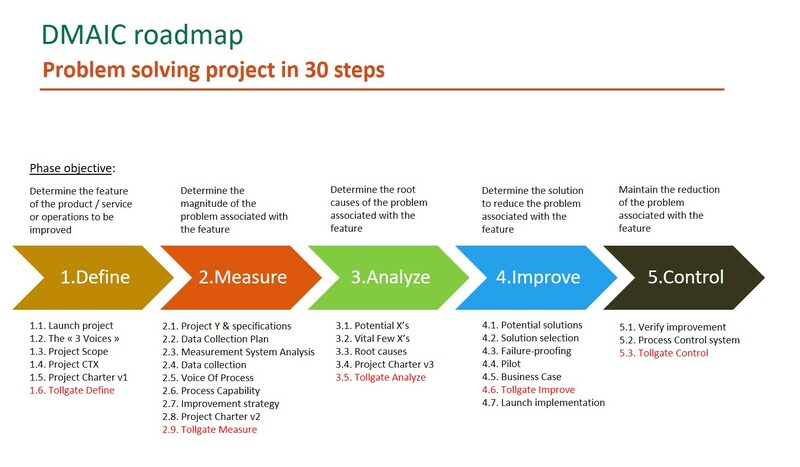 The starting point of a project is defined during this phase in which the team is responsible for selecting the right measures and creating a plan for data collection. At the end of this phase, you should have data about the baseline process and an updated project charter. The data that is collected during the Measure phase will be analysed in this phase to closely examine the process and determine the cause(s) of the problem at hand. In this phase, the data might be visually displayed through the use of data analysis and process analysis tools for better interpretation. Once you are aware of the cause(s) of the problem, it is time to brainstorm the possible solutions, design the future state process map to project expected outcomes, and then choose (and implement) the solution the meets these outcomes. At the end of this phase, you are expected to measure improvement in the process and check whether it is on par with the expectations. For assuring that the improvements are sustained, a monitoring and sustenance plan is developed and implemented during the Control phase of the DMAIC project. During this phase, the process improvement infrastructure is passed on to the employees working with the process for continuous improvement using Lean Six Sigma principles. The purpose of a DMAIC project is to solve a problem that is associated with a process, waste or quality issue within the organization which in turn makes the process more efficient and reliable. Therefore, the first thing that you need to do is to identify the problems, deficiencies, and inefficiencies that exist within your organization. These areas of concerns are what becomes the basis for the ‘problem statement’ in the Define phase of the DMAIC methodology. One important thing to mention here is that not all problems have to be solved through DMAIC. At certain times, an effective solution to a problem is already known which means that there is no need for applying DMAIC and at other times, a problem can simply be too complex (and may require an entire process redesign) in which case it cannot be solved through DMAIC. Before you can proceed forward, you must first determine whether a project meets certain criteria for DMAIC. There are 8 key selection criteria that you need to make use of for assessing the viability of a DMAIC project. Customer impact: If the project is successful, will it positively impact the customers and will it increase customer satisfaction? Problem statement: Is the problem well-defined i.e. does it have a specific element or area of concern that needs to be fixed? If not then the project could lose its focus due to lack of clarity. Clarity of solution: Is a solution to the problem already known? If yes then there is no need for continuing with DMAIC for solving the issue. Benefits offered: What is the value of the project quantitatively and qualitatively? A cost-benefit analysis and cash-flow analysis need to be conducted to determine whether solving the problem will benefit the organization or not. Process stability: If the targeted process is new then it has likely not reached a stability yet which means that the impact of the solution could be different than predicted by DMAIC. Sponsorship available: How much support does the project have from the LSS team? Strong sponsorship is what distinguishes between success and failure in a DMAIC project. Project alignment: Does the project (and its objectives) align with the corporate strategy of the organization? If no, then there is less likelihood for the project being funded or supported by the Lean Six Sigma team. Process redesign: If the process that is being examined cannot be improved further without having to be redesigned then the viability of the DMAIC project can be in question, as well. Once you are aware of the problems that exist within your organization, the next step that you need to take is to discuss the projects with the rest of the Lean Six Sigma team. Arrange a workshop that will be headed by the LSS Leader (or Champion) and will involve the Head Of Divisions, LSS Program Manager, Black Belts, and Green Belts. Discuss the DMAIC projects with the team and assess each project with the help of the key selection criteria that we mentioned in the previous step. Determine how strongly the administration and executives support each project and make use of this data for prioritizing the projects. You can make use of tools such as selection charts that list out all the projects with their access time and access resources for determining the viability and importance of a DMAIC project, as well. The aim of this workshop should be to come up with at least 20 deliverable projects for the first year of LSS implementation that have been ordered in the sequence with which they will be initiated. Once the projects have been decided, the Black Belts will be given the responsibility for analyzing, refining, and implementing them. The goal should be to gradually increase this from 20 projects in the first year to 83 in the second year, then 184 in the third year, then 293 in the fourth year, and then finally 396 in the fifth year of the LSS implementation. These statistics are for a company of 10,000 people. This is an optional step that you can take in order to optimize your project selection process. The use of project selection tools will help you balance the selection process so that the risk of project failure is minimized. The purpose of this additional process for selection is to select projects that best utilize the resources and time that is available to the organization. The tools that should be used for this purpose are the S-C-P Model and the SWOT Analysis. The S-C-P (Structure-Conduct-Performance) model is a top down approach for determining whether a project will be effective or not. In this model: Structure measures economic value; Conduct measures that ability to exploit maximum value; and Performance measures the potential or chances of success for the project. The SWOT (Strengths, Weaknesses, Opportunities, Threats) analysis is a tool for performing a realistic assessment of the projects through a specified thought process. The Strengths of a project are based on its distinctiveness, competencies, and resources available; the Weaknesses are the unrealistic parts of the project that are the hardest to achieve; the Opportunities assess whether technical and economic trends can produce higher return and value than expected; and the Threats are the barriers to success for the project (management support, buy-in, etc.). Most usually, the SWOT analysis is conducted after the S-C-P for highlighting the strongest projects (which should be prioritized) and the weakest projects (which should be eliminated). These results can be further filtered down through processes such as the VRIO (Valuable, Rare, Imitable, Organized) analysis. However, you are not required to go into such depth in the early years of LSS implementation since the number of projects are already limited (and do not require rigorous filtering). A DMAIC project is responsible for solving a problem that exists within an organization. The five phases of DMAIC are: Define, Measure, Analyze, Improve, and Control. Each of these phases plays a vital role in the problem-solving methodology of DMAIC. When you are looking to find the right DMAIC projects for your organization, you should identify the problems, filter the projects, and organize a project selection workshop with the LSS team. If needed, you can refine the projects further by making use of project selection tools such as S-C-P, SWOT analysis, and VRIO. The goal should be to start with 20 DMAIC projects in the first year and then gradually increase them to 83 in the second year, then 184 in the third year, then 293 in the fourth year, and then finally 396 in the fifth year of the LSS implementation.